Halloween is fast-approaching so naturally I've spent the last few weeks on the lookout for spook-themed goodies hitting the high street. 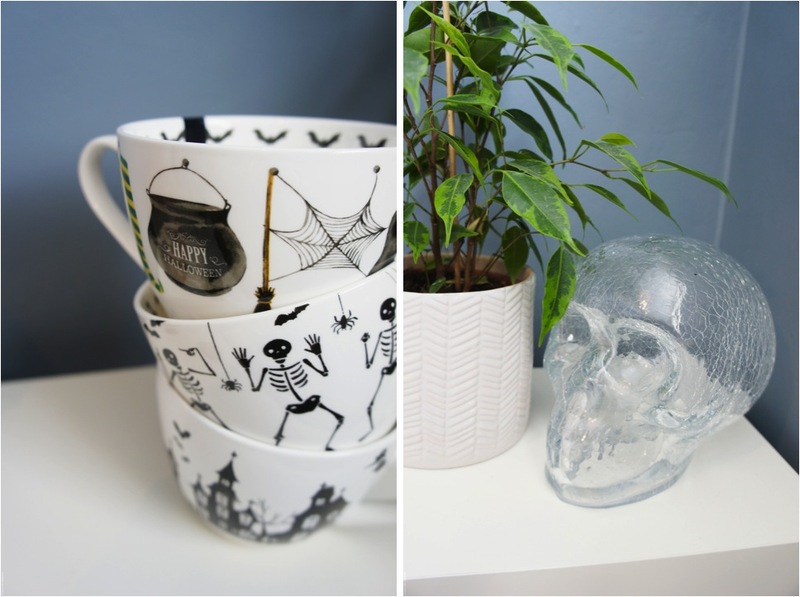 I picked up these amazing Halloween mugs at my local Home Sense, where there were so many different designs to choose from it's surprising I only came home with three... Although, if we're being completely honest I'm very tempted to go back to buy a couple more! As if the beautiful illustrations on the outside aren't enough, each mug is also decorated on the inside, with a pattern around the rim and a message printed in the bottom. They're also pretty large mugs, making them perfect to hold a whole lot of hot chocolate Oatly! A glass or crystal skull is a home decor piece I've been looking to add to my 'stuff for my future house' collection for a while and of course this is the perfect time of year to get one. This large cracked glass skull was another Home Sense find that sits perfectly on my current bedside table and will look great on a future coffee table or bookshelf. Whilst I love the clear glass look I'm also thinking about sitting an LED tea light underneath it for a cosy light in the evenings. The ceramic jar with illustrated beetle design was another find that I immediately decided needed to join my collection. I first saw these jars before my move but didn't buy one as it would have been an extra breakable item to pack, so I was pleased when post-move I found my local Home Sense had a few left in stock. I really love how the monochrome design looks with my freshly painted blue walls but I'm not sure whether I'm going to actually use it to store anything yet! Moving away from home decor, I also picked up a set of cute washi tapes and pair of skeleton hand hair clips from Flying Tiger, as well as some glass clings from Poundworld. As usual I'm planning to celebrate Halloween by carving pumpkins and watching horror movies with friends so when I stumbled across 'Misfortune Cookies' at my local farm shop I couldn't resist picking some up to share. According to the packet these are black fortune cookies, each with a note inside. They're wheat flour based so not 'free from' friendly but they were too much of a unique novelty to pass up. Have you made any Halloween purchases this year?